One thing we always have on our shelf is Duck Tape. There are knock-offs, but none work as well as the original. I never realized how many styles there were until doing this post. There's a tape for every purpose. The kind I'm most familiar with is called Standard Duck Tape. It's grey, sturdy, and has a cloth layer that makes it easy to tear. One of my chores at the cabin is to collect floating chunks of wood for kindling. We gather them in large plastic tubs. Over time, the plastic cracks. Rather than throw the cracked ones away (save that nail), we repair them with Duck Tape. That way we can get a few more years of good work out of them. In this one, I left the hole open so water can drain out as the wet wood dries. Here's an interesting video about how they make Duck Tape. My herbs are perennial, but I cut them back in fall and they are dormant in the winter. Here you can see my mint, basil, and thyme. I also have parsley, sage, and rosemary. With softer herbs like parsley and basil, I remove the leaves and let them dry on cookie sheets before storing. For woodier herbs like thyme, sage, and rosemary, I hang them to let the leaves dry on the stems. I use a rack in the new bathroom. It gets the least sunlight and has plenty of air circulation. When there's no moisture left in the leaves, it's time to store them for future use. Here's my last thyme harvest. On the left are the dried leaves on their stems. On the right, the stripped stems, and in the middle the fruits of my labour, lots of dried thyme. To store my dried herbs, I reuse plastic containers from Crystal Light. I label and date the containers and store them in the new pantry you can see in the picture above. Last Friday I shared some aerial shots from a Pacific Coastal Airlines flight for Sky Watch. Crafty Gardener suggested I share them as a part of Weekend Reflections, so here goes. Since the reflection on the shiny prop spinner followed us all the way from Vancouver to Powell River, BC, I had lots of opportunities to get more. Here are two more from my collection. I was at DuaneBurnett.com this week and learned that it's the 40th anniversary of the iconic Canadian television sitcom The Beachcombers. 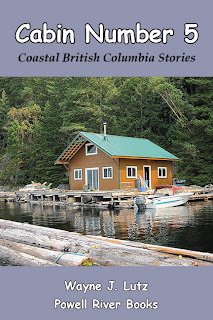 He put together a tribute video using pictures from the Sunshine Coast Museum and Archives in Gibsons, BC, Canada, and his own fan photos from his youth. Take a look. 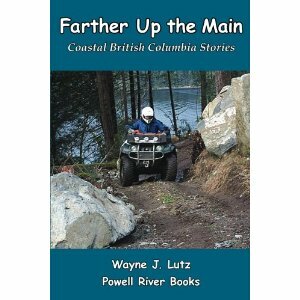 Since we moved to Powell River, Wayne and I've heard about The Beachcombers. It was a huge hit across the country and was Canada's longest running TV series. We tried to purchase a DVD of the shows, but they aren't available. All we could find were a few clips on YouTube. The show ran for 19 years and was about a log salvager (a beachcomber) who lived and worked around Gibsons BC. 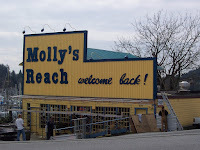 Prominent in the show was Molly's Reach, a restaurant on the Gibsons waterfront. You can still go there for a meal and see their boat the Persephone out front. You can even join their Facebook group. Our float cabin on Powell Lake is under the flight path of jetliners heading to and from Vancouver International Airport. 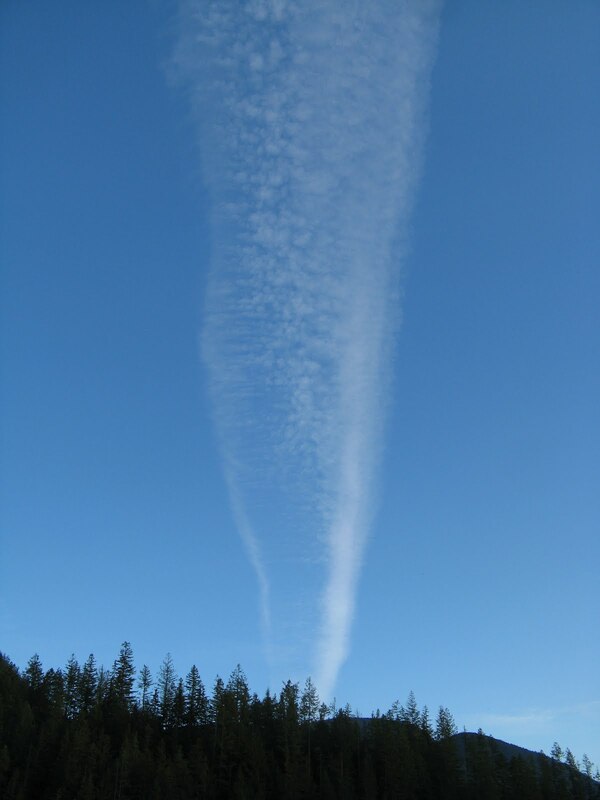 Contrails are linear clouds that are formed in the wakes of airplanes at high altitude. This is the beginning of the contrail over the northwest horizon. Boat names that have caught my eye and shutter. Today you get a twofer. You heard how Wayne likes to name things Mr. Our good friends Ken and Sam from Gibsons did something similar. 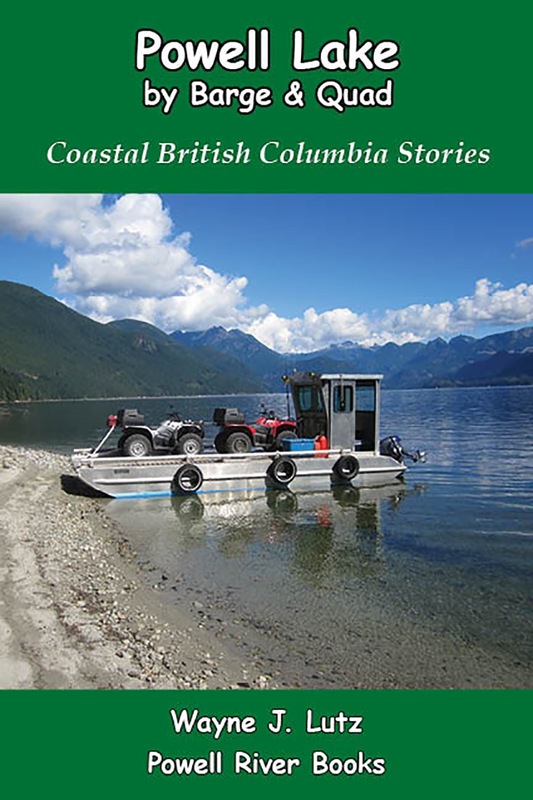 In 2007 they had a new welded aluminum boat built to their specifications at EagleCraft in Campbell River. She's a skookum (strong) ship that they christened Mr. Buttercup to go with her bright yellow paint. Gracing the top of her cabin is Miss Daisy, their Walker Bay dinghy. 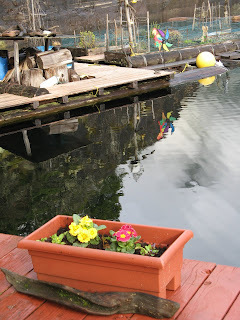 Last week at the cabin I did get to prepare the soil in my floating garden for spring planting. Last year at this time it was still frozen. This winter is milder, so I was able to work it up, no problem. We went to Canadian Tire to get steer manure. It's early in the season, so we had to go out back and get it off a pallet. Half a bag went in each bed, then I used the shovel I won in the Sunset Magazine garden photo contest to turn the soil over and dig it in. The manure helps replenish the nutrients in the soil. Now it can rest for six weeks until I do my planting in April. That way it won't burn my seeds or seedlings. Last Fall I really cleaned out my beds. The annuals and strawberries came out and were added to my compost pile. All that remains are my herbs and asparagus. And my daffodils and hyacinths that are already poking their noses up. Mr. Bunny is trying to protect them, but someone is nibbling the tender tips. While we were at Canadian Tire, they had Primulas on sale. I couldn't pass up those bright spots of colour. I bought four to add to my planters on the deck. I didn't realize they are perennials. Most of my Primulas from last year survived the winter right in the planters. They are small, but look like they will come back again. Welcome to my fourth installment of float cabin tours. So far you've been welcomed aboard our cabin that is built on a 40X40 foot cedar log float, you've walked through our new bathroom and guest bedroom with a brand new window, and you got to experience our off-the-grid kitchen with propane appliances and a hand water pump. The tour continues with our upstairs sleeping loft and downstairs living room that's part of the open concept great room. We spend most of our indoor time here. The square footage is small, but ample for two to live comfortably. p.s. The thermoelectric generator is no longer operational. It lasted for three years, but after we renovated our cabin interior it would no longer work. It was a great concept though. 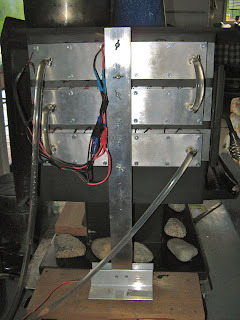 As John was wiring, I was researching commercial thermoelectric generators for wood stoves. Thermoelectric power generation is common in large businesses, but home applications are few and far between. 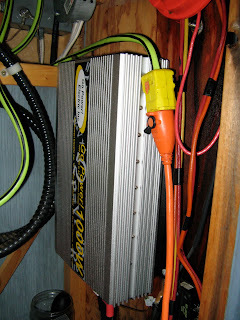 Then I found a video on YouTube and contacted the vendor, TEG Power (unfortunately no longer in business). 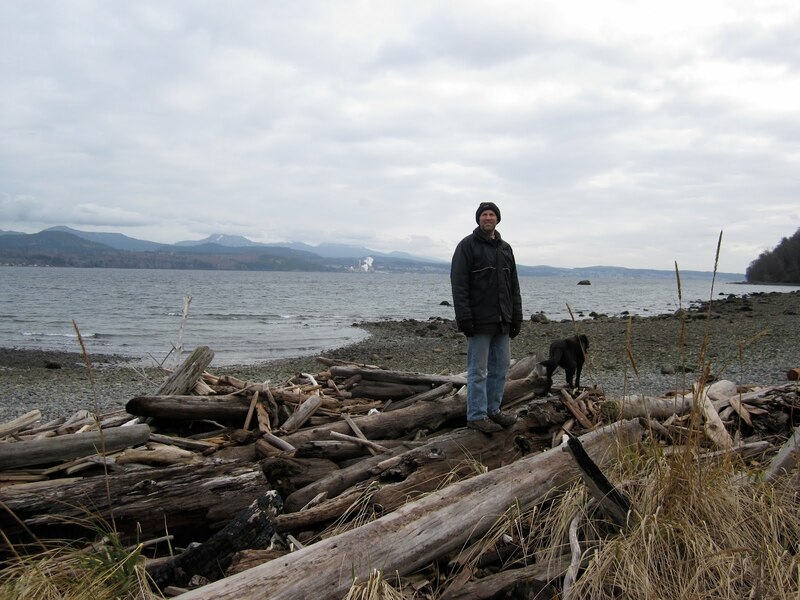 Ron was in the initial stage of producing modules to work with wood stoves. Then he changed his design to a hybrid thermoelectric generator. 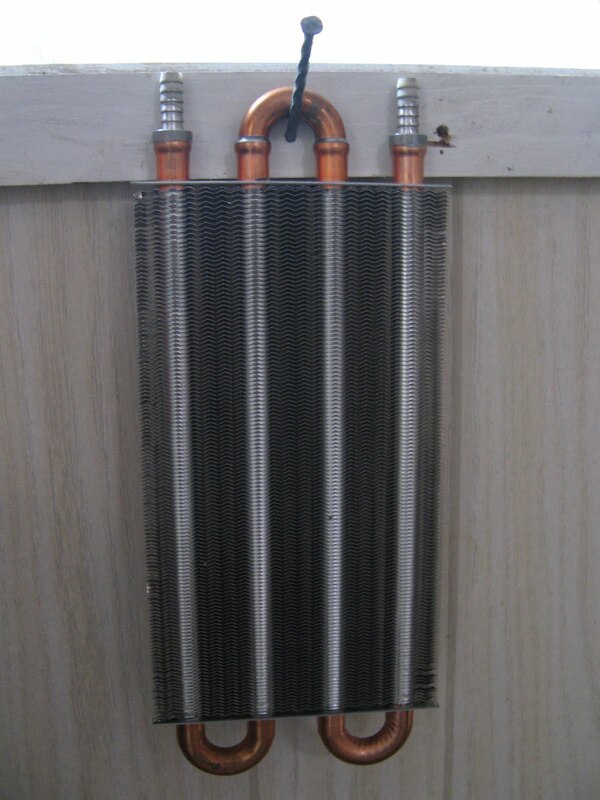 I have not found anouther company that sells a complete system, but there are several that do sell individual components that you can use to build your own wood stove generator, if you have the skills. You might check out TEC from Ontario, Canada. After John had the wiring in place, and our thermoelectric generator arrived, it was time to test our new system. It came with directions, but Wayne and I are new to electrical applications. We sure learned a lot along the way. We purchased three 25 watt strips for a total of 75 watts of output. In amps, that's a little more than 6 under optimal conditions (heat of fire vs. coldness of water). In our tests, we got about one amp per power strip. To make the cold side of the system work, we have to use an electric pump that uses about one amp, so the total charging capability of our system was around 2 amps. But if you know batteries, small trickle charges over a long period of time are the best. Wayne and I are always looking for renewable sources such as solar and wind to make electrical power at our cabin. In the winter however, neither one can generate enough so we have to resort to a backup generator to keep our batteries charged and in good condition. I knew there was something called thermoelectric power (we had a co-generator back when I worked at the school district). We have a wonderful heat generation device at the cabin, our wood stove. And in the winter it runs pretty much 24/7. 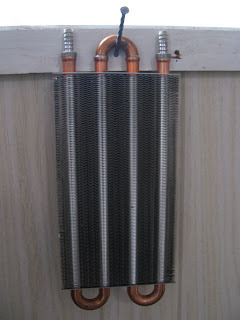 Just think about all that wasted heat energy. 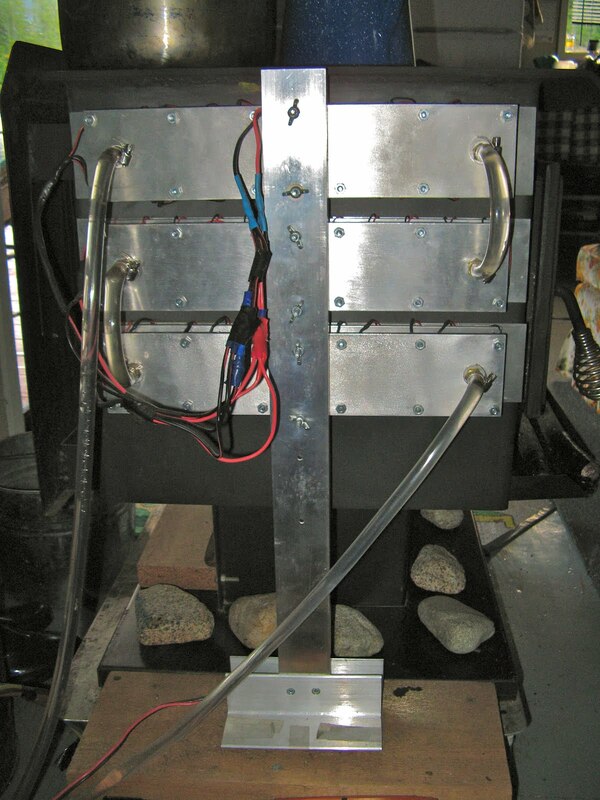 So several years ago, I did some research on thermoelectric power using a wood stove. I found this article about a project in Sweden. I knew it was possible, but I also knew we didn't have the skills to do on our own. We began in October 2009 by asking our good friend John for help. 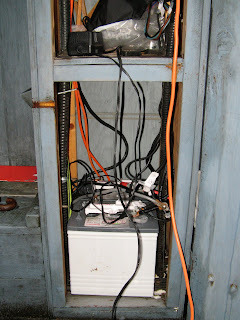 John helped us run the wire needed from our wood stove at the front of the cabin to the battery bank in the rear. We had some heavy duty cable left over from our wind generator installation, so that was perfect for the job. We don't have a basement, but there is a crawl space under the float deck that serves a similar purpose. After running the wire underneath, John prepared the two ends for connections. 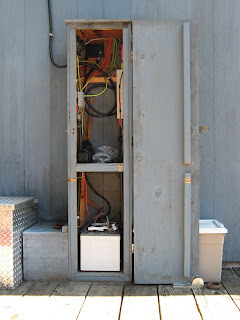 He also tied the cable up under the deck flooring for additional protection from the elements. 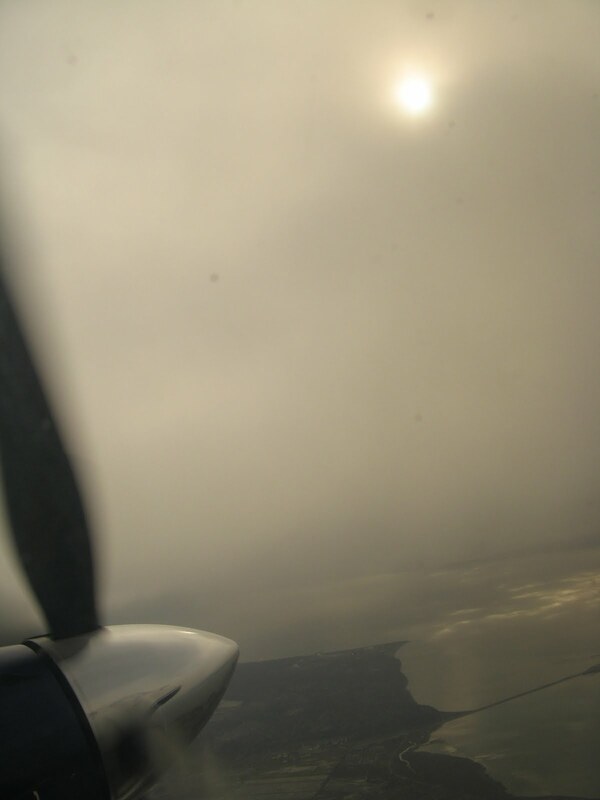 Earlier this week, Wayne and I flew from Vancouver International Airport's South Terminal to Powell River. It's a frequent route for us. The day was rainy, turning to clear. I looked out my window and saw something very interesting. 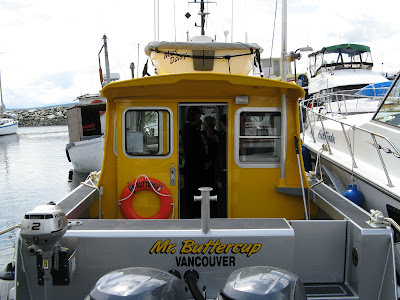 Boat names that have caught my eye and shutter. Wayne likes to name things Mr. There's Mr. Blue (the kayak), Mr. Bathtub (the dinghy), and then me, Mr. Boat. I'm Wayne and Margy's 18' Campion runabout. I get them up and down the lake in all kinds of weather. That makes me their most important boat, if you ask me. Today I get to go home up the lake. It's my favourite place to be any time of the year. It may still be winter, but my thoughts are about the coming spring. The first thing we did when we got back to Powell River was head to Canadian Tire. Lucky for Wayne, I'm an easy kind of gal. All I wanted for Valentine's Day was two bags of steer manure and a few colourful Primulas for my deck planters. Over the next week, I'll work up the raised beds on my float garden and add the manure. That way it can rest for about six weeks before I plant my seeds in April. I've found if I plant too soon, the manure is so strong that the seeds don't sprout and mature very well. If I get my my garden done by mid-April, there will be asparagus, strawberries, green onions, lettuce, and chard to harvest starting in June. The beets, carrots, potatoes, onion bulbs, garlic, peas, and beans will need until mid-summer before harvesting. But it will all start this week with dreams of spring and good soil preparation. Even if I can't physically be at my cabin, my heart is always in our float home. 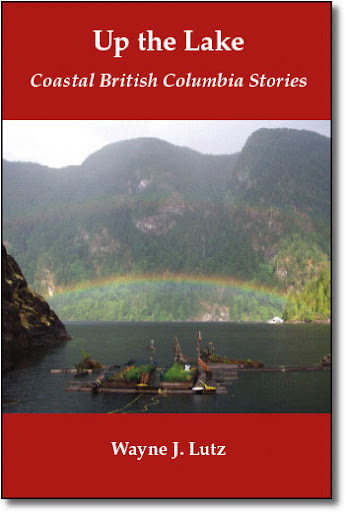 It so inspired my husband Wayne that he wrote the Coastal BC Stories series. 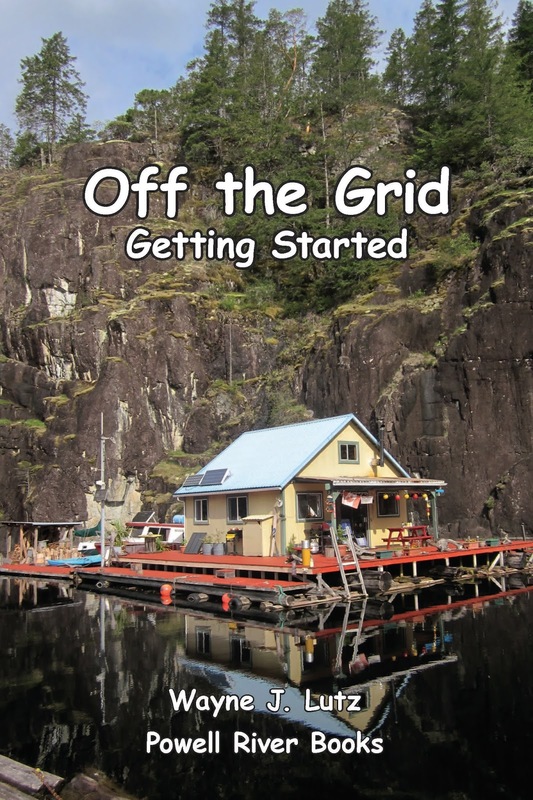 Read Up the Lake and Farther Up the Lake to learn more about about our unique off-the-grid lifestyle. It was 2000. Wayne and I flew in to Powell River as a part of our annual summer vacation. We extended our planned one night stay to two weeks, our entire holiday break. That first summer we enjoyed exploring all that Powell River had to offer. 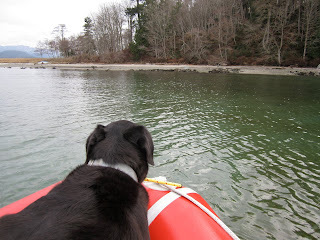 We went to Okeover Inlet twice to go sea kayaking. I remember well, on a drive up Highway 101 towards Lund, asking Wayne if he could ever live in a different country. And here it is, the fourth anniversary of our landing in Canada on February 11, 2008 as permanent residents. This year Wayne and I are celebrating with Mom in Bellingham. But Wednesday will have us back in our float cabin home snug and warm. As you can see, the answer to my question to Wayne was a resounding YES! We love our new home, and our new country. When Wayne and I head out on a boating adventure, one of the things I like to do is read the names of boats. I thought I would share some that caught my eye and shutter. To kick off the series is our own Halcyon Days. 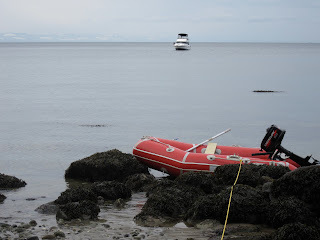 Soon after we arrived in Powell River, we knew we wanted a boat to explore the BC Coast. Halcyon Days came to us already named. Among other things, halcyon means happy, carefree, joyful, tranquil, and peaceful. It's also a mythical bird said to be capable of charming wind and waves into calm. Sometimes Wayne stays in Powell River while I'm in Bellingham with Mom. On a recent "bachelor's" week, he went boating with our good friend John and his dog Bro. Powell River is perched on a hillside rising from the Strait of Georgia, allowing many houses to have a view of the water. In front of Powell River is Harwood Island. It's part of the Sliammon First Nation reserve. One of the reasons Wayne and John wanted to visit Harwood was because of an old winch (you can see it here) that was abandoned after the island was logged many years ago. It was a huge piece of equipment, but after getting to the long spit on the northeast side, low and behold, it was gone. That must have been some salvage operation! Welcome to my third installment of float cabin tours. So far you've been welcomed aboard our cabin that is built on a 40X40 foot cedar log float, and you've walked through our new bathroom and guest bedroom with a brand new window. Today I'm taking you through our remodeled kitchen. The biggest change was new propane appliances and extra storage space. For more information about our Unique brand propane refrigerator click here. It's a home style refrigerator, not the RV type of most propane models. Propane ranges are a bit easier to find. We chose the Premier brand carried by our local Rona store. We love all the recent upgrades to our cabin. But if you ask Wayne, he'll say the best is the new refrigerator. Now we have plenty of room for milk by the gallon (Wayne loves milk and cookies) and freezer space for roasts on sale. We try to rely on renewable resources using solar, wind, and thermoelectric power, but on occasion we need a generator to give our batteries a good charge. If they drop too low, especially in the winter, it's very difficult to get them recharged enough to use our cabin electrical system. Our first gas generator is an older portable Coleman. It has 1400 watts of output and still provides us with power options, especially when we want to use power hungry tools such as a circular saw. We just purchased a new Yamaha EF1000iS, mainly because it is quieter and more fuel efficient. To the left, one of the AC outlets is being used with a plug-in 12V slow trickle charger attached to our secondary battery bank in Wayne's remodeled boat. There is also a DC connector for a fast charge. However, it's recommended not to use both at the same time. Because there are two AC outlets, the 1000 watt capacity can run two trickle chargers at the same time. This allows us to efficiently boost the batteries in the boat's isolated system and the cabin's electrical cabinet at the same time. The Yamaha has a "Smart Throttle" that is load sensing and can automatically change the rpm to match the need. The result is a lower (and quieter) engine speed for most applications. The following video is at full power while using the CD charger. While charging is going on, we still want to use electrical devices in the cabin. 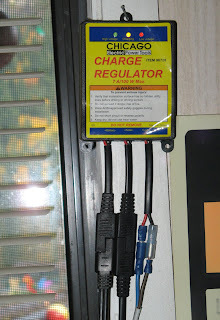 An additional heavy-duty extension cord from the second AC plug bypasses the inverter and plugs the generator directly into the cabin's electrical system. This way we can recharge our portable Nautilus battery pack, computers, cell phones, gameboys and have lights without affecting our battery banks. Today when we got home from the Seattle Boat Show, I heard birds singing in the trees behind Mom's condo. I had to go investigate. I then had to go out and record their raucous song. They are new to our area.